One of ArtString’s mission statements is to bring the hidden stories of museum collections to light, and help visitors to relate to artefacts and objects that can seem alienating or distant, or part of a museum culture they’re not familiar with. Keeping up with online criticisms to and discussions about museum collections brought several contentious areas to light. Something I knew we needed straight away was to highlight the contributions of women in the collection in the most visible possible way, particularly in the arts. Since the mid-1980s the Guerilla Girls collective have drawn public attention to the limited amount of work by women artists in museum collections, compared with the large numbers of female subjects of male artists. This can be quite alienating for women & girls visiting a museum or gallery and receiving the message that they’re meant to be passive, contained within art instead of creating it! Creating the Women Artists string, I knew I’d face some hurdles. Currently ArtString’s collection access is to the public API of the British Museum, the National Gallery, and the Science Museum, and while there are some very famous women artists in the collection of the Tate Modern, the period covered by the National Gallery was likely to be thinner on the ground. All the more reason to bring women front and centre. It’s important not to overlook the obvious, so the first thing I did was to Google “Women Artists National Gallery London”. There’s a glossary page among the first results which explains that women artists in Europe before the 19th Century were usually the wives or daughters of male artists, and had access to art education that way. What the page doesn’t mention, and which needs framing, is that this also gives the women artists in question access to the art market, with patrons and curators who’ll commission and display their work, leading to the kind of popularity that gets works famous and influential enough to be featured in the National Gallery collection. Culture doesn’t happen in a vacuum. What goes into a work of art is informed by the society it’s created in and the experience and knowledge of the artist, but also the perceived desires of the patron and/or curators. The glossary page names a disappointingly small number of women artists, as I’d expected, but I delved into them all the same. 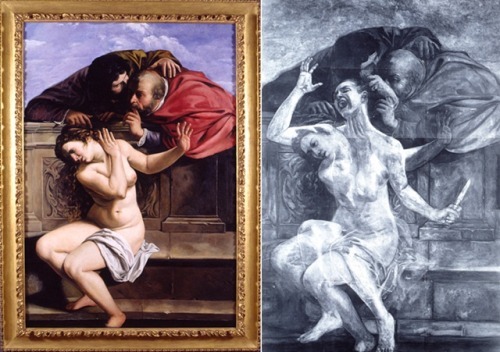 I was excited by the prospect of being able to write about Artemisia Gentileschi, a powerful painter whose work was was the inspiration for a 1998 piece by Kathleen Gilje, and whose dramatic legal and financial difficulties with men in positions of power speak unfortunately clearly to women today–her work is vivid, direct, almost muscular, obscuring its own theatricality of pose with the sincerity of emotions. Except the National Gallery’s acquisition isn’t available to ArtString’s interface, and I can’t add her to the under-populated women artists string. Of the women artists mentioned, Berthe Morisot, Rachel Ruysch, Catharina van Hemessen, and Elisabeth Louise Vigée Le Brun are the only ones whose works are available to visitors. The National Gallery might have the only signed and therefore confirmed painting by Dutch Golden Age flower artist Marie Blancour, but they aren’t putting it out to be seen. It could be argued that one flower painting looks pretty much like another (I’m not sure the 17th Century Dutch patrons of Ruysch and van Huysum–the latter a male artist whose work features heavily in the flower painting section–would necessarily agree with that). Rosalba Carriera’s portraiture uses an underrepresented medium for the gallery–pastels–and perhaps there’s difficulty with conserving works in this medium. Again, one would hope that’s the reason. This man’s eyebrows deserve to be seen. Lastly, another Dutch 17th Century artist, Judith Leyster, gives us a wonderfully cheeky image of two children causing imminent mayhem with the use of a cat and an eel. Perhaps it doesn’t have the drama and gravitas of a history painting, or perhaps we’re still reproducing some of the genre chauvanism which led to the original undervaluing of landscape art in Britain in favour of the “more serious” historical painting… and the founding of the Royal Academy of Art. While the National Gallery’s online catalogue was sparse on women artists, the British Museum’s is sparse in a different way: there is no handy index of artist information, no well-linked glossary of names. However, for International Women’s Day, the good people at the British Museum’s blog had asked several of their curators to talk about women artists. Once again, the majority of featured works in that entry aren’t available to ArtString–Susanne Court’s beautiful dish is a mystery, but several of the works on paper were part of a temporary exhibition. While Jill Cook’s fascinating video on the female gaze in Ice Age Art is absolutely worth watching and highly recommended, for the Women Artists string I wanted to focus the scope on confirmed, named artists that visitors could identify as real people, and connect with. It’s a shame that we have no way of knowing yet which artists of the Ice, Stone, and Bronze ages (and Iron Age too) were women, but when and if we do find out, one hopes the collections will be updated to include that information! I had one last plan. While investigating women artists in the personal circles of the few women on display at the National Gallery, I’d noticed that in the past at least there was rather less variation in given names. A lot of Mary, Marie, Catharine, Elizabeth, Victoria and so on. This method yielded the extensive work of the highly-acclaimed (during her day), influential (Sir David Attenborough has said that her work depicting the first Western recording of butterfly metamorphosis changed our understanding of insect life in a fundamental way), and now little-mentioned German-Swiss artist and entomologist Maria Sibylla Merian. The British Museum has a satisfyingly huge number of her prints from her self-funded naturalist investigative expedition to Surinam, and for the first time in the construction of the string I found myself having to choose what to include rather than grabbing at straws! Finding the artists of colour represented in this string–Dorothy Brave Eagle (Oglala Lakota nation) and Eva Anderson (Ngāti Porou iwi)–took some creative thinking. While I was taking my Hail-Mary search quite literally and searching for Marys among the indices, I found a reconstructive work by the textile archaeologist and activist Grace Mary Crowfoot. I was reminded that women’s artwork is often overlooked because it occurs in undervalued media (and media often undervalued precisely because they are media which are favoured by women! ), and set out to look specifically for textile art with attributions. A lot of textile art acquired by the British Museum has no known or credited artist (I have successfully I identified the creator or at least atelier behind one uncredited piece so far, but that’s a story for another blog). But among that which does have attributions are the bags of Eva Anderson, and Dorothy Brave Eagle. As the work of women is substantially buried within the collection at the British Museum I’m hoping to uncover more as time goes by. The hunt has been thrilling so far–I’ve found names I wasn’t familiar with and had the opportunity to learn about some fascinating personal lives (Grace Mary Crowfoot, for example) and to discover how, even in our digital age, sometimes information on artists (Eva Anderson especially) can be extremely hard to uncover. I’ve also been reminded that it’s sometimes necessary to abandon preconceptions about what constitutes art in order to find where artworks are hiding. Related strings: Women in Science, Women in Action, Warp & Weft: Woven History.